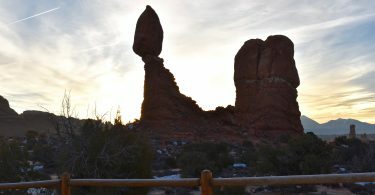 Along with Delicate Arch, Devil’s Garden is a major draw in Arches National Park. 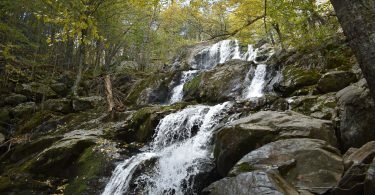 This very popular trail runs up to 8 miles though we rarely go that far. It passes half a dozen unique and beautiful arches along the way and ends at a finger of stone called the Dark Angel. We’ve only hiked that far once, but we’ve done shorter stints with our boys several times. 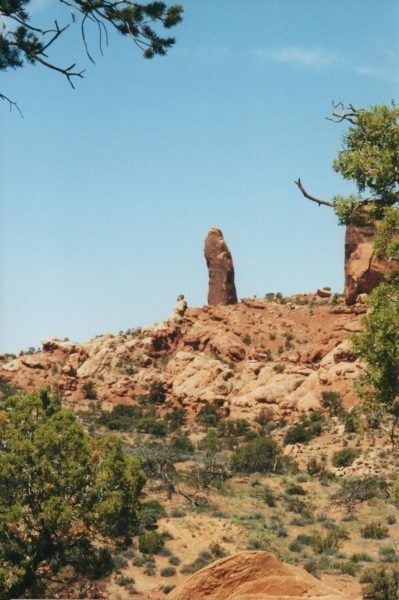 The trailhead for Devil’s Garden is right at the end of the Arches National Park road. There is a lot of parking, but this area may be the busiest in the park. A lot of people will be strung out along the trail, and the lot will be mostly full. A hike in the morning or near sunset is usually less crowded, and less hot. One thing to note about Devil’s Garden is that there are many short side trails to arches. None of them extend very far, but each adds to the overall distance. 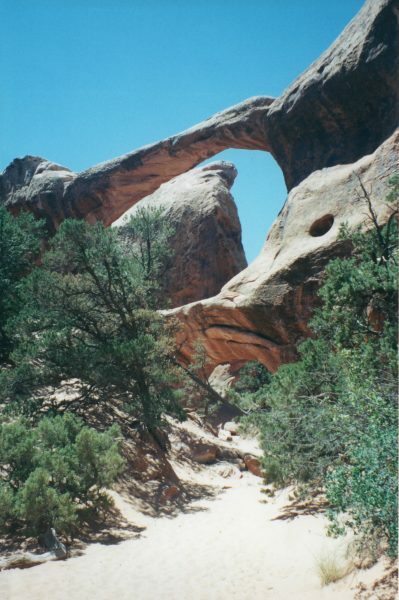 We usually plan to go to Landscape Arch and back, taking the shorter trails along the way. This adds up to considerably more distance than the 1.6 miles out-and-back listed in park literature. We figure it is closer to two and half miles. 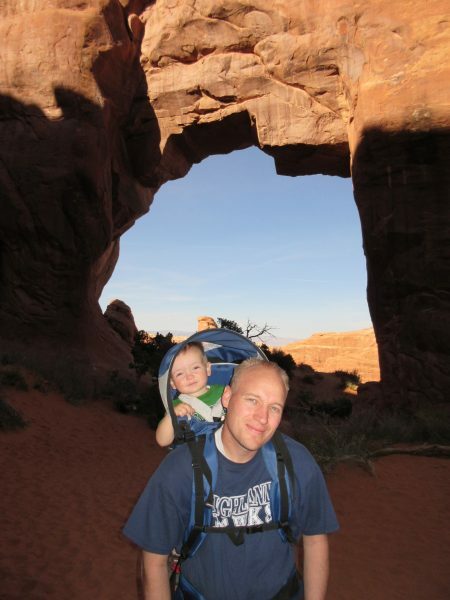 If you have small children or don’t feel confident in your hiking ability, or even if you have a limited amount of time, take this hike only as far as Pine Tree Arch. From the trailhead, it is about a mile to Pine Tree. 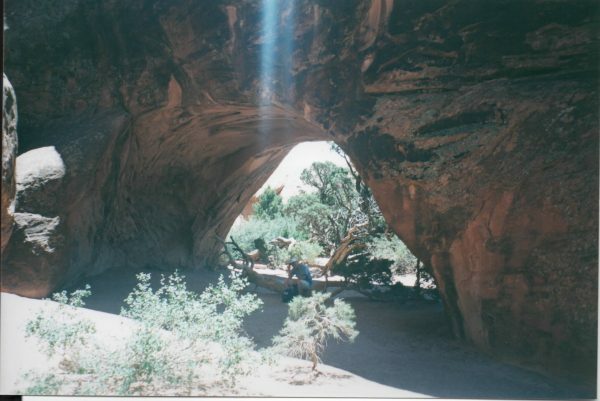 This allows you to visit both Pine Tree Arch and Tunnel Arch. It requires making a right turn off the Devil’s Garden Trail at the sign. Pine Tree Arch is right near Tunnel Arch. Landscape Arch is thin, but very long! We usually opt for the intermediate route with our children. This means walking as far as Landscape Arch. 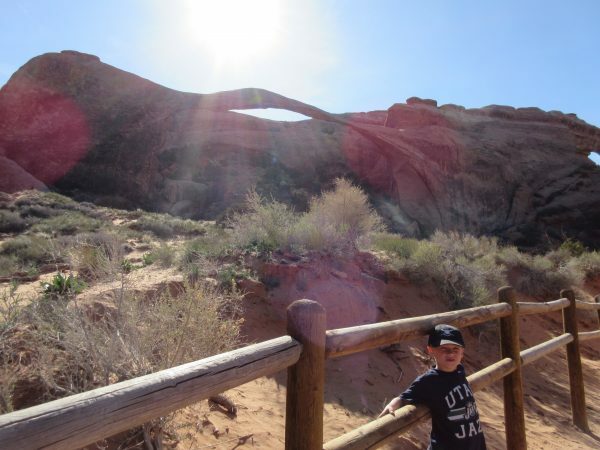 We like this option because it allows you to see the second most iconic arch in the park, which is Landscape Arch, as well as the two arches listed in Level 1. 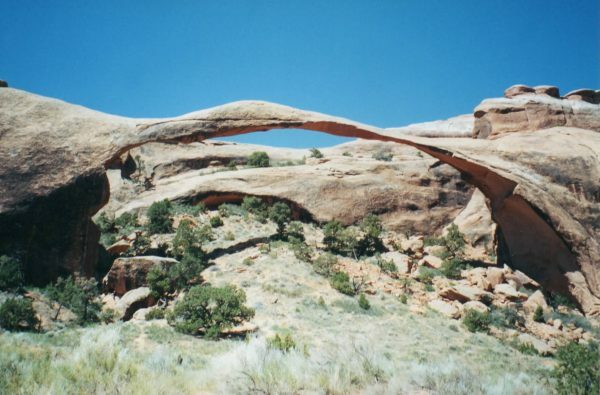 Landscape Arch is unique in its appearance, and has the unbelievable span of 290 feet! This hike ends up being around 2.25 miles RT. Our boys were dying by the time we made it. It was hot, and our oldest was 6. Navajo Arch is almost like a cave. 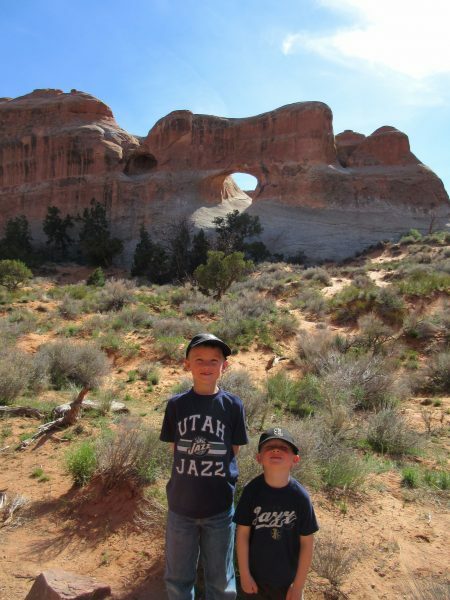 For hikers that are a little more advanced (we’d say 10 and older if you’ve hiked a lot), we recommend going to the turnoff to two additional arches. Farther up the main trail from Landscape, you can turn off to make a short trip to Navajo and Partition Arch. These two arches are beautiful and worth the visit if you can make the long trek. You can also see the remnants of Wall Arch that collapsed in 2008. Adding in these arches will add another mile RT, so this hike will be about 3.5 miles. Partition Arch is the larger arch to the side, but it also has this smaller hole to see. We took this picture back in the old days, but we wouldn’t climb in the Arches now. Double O Arch is awesome. Two arches in one! Before we had kids, we made the hike all the way to Dark Angel. It’s hot, unforgiving, and pretty difficult. This hike is for teens and above. Furthermore, though Double O Arch is pretty amazing, the Dark Angel isn’t that great. It’s a finger of stone standing up in the middle of the desert. Double O Arch is two arches on top of each other and is very impressive. 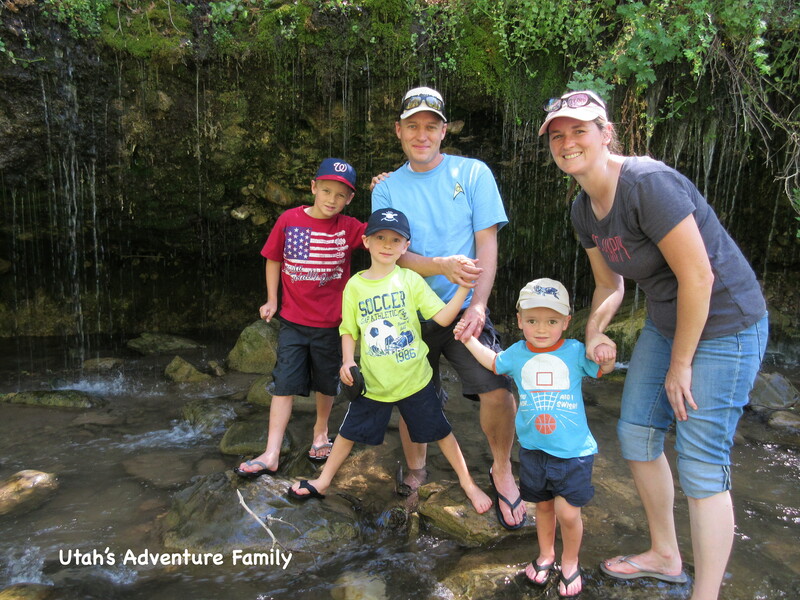 It was one of our favorite hikes in the park, and we can’t wait for our kids to be old enough to hike there with us. This hike with all of the extra hikes adds up to be 6.5 miles RT. The Dark Angel is underwhelming. 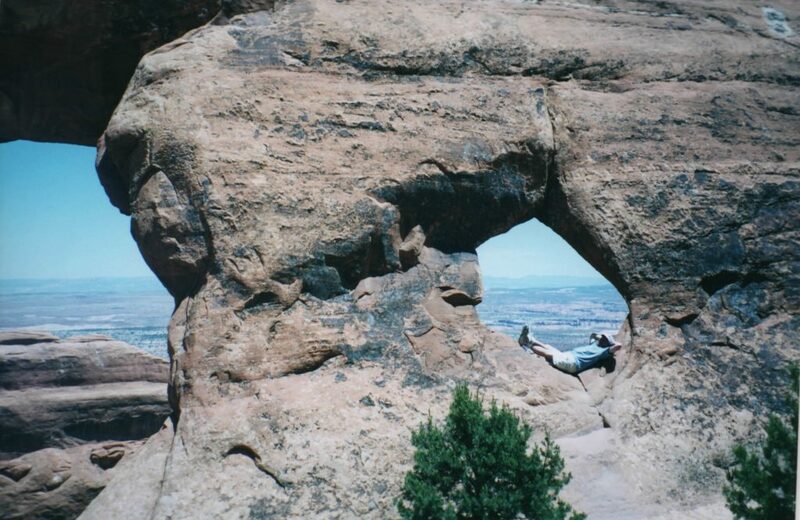 There is also an option to take a primitive trail around to a so-called private arch. This extends the total hike to nearly 8 miles, and we haven’t been that adventurous yet! Here is a pamphlet with a map and details. 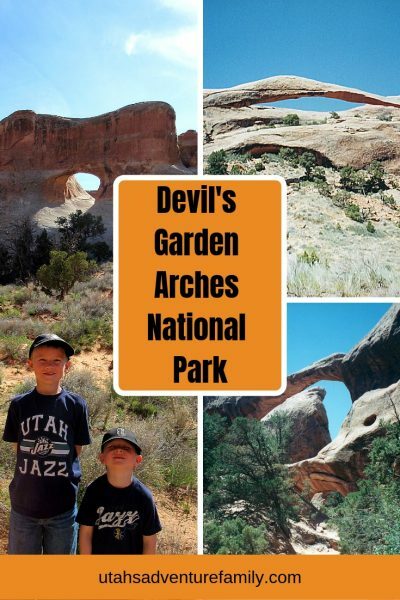 We love visiting Devil’s Garden, and we love that there is something on this trail for everyone.